A checklist tells you what species have been found, but nothing about them. This is an annotated list and it tells you how much of each we have found or seen, and where or in what habitat. In the past ten years we have found about 215 species in our one-square-mile Study Area, close to half the number known in the 2800-square-mile Ottawa region. We are still finding additional species when we go looking for them. There could easily be another hundred species of minute lichens, especially sterile crusts. We have not thoroughly surveyed the genus Cladonia, either. This list may also tell you how rare or common each species is in the region, based on assesments published in Lichens of the Ottawa Region (1988, by I.M. Brodo) and The Lichens of Southern Ontario, Canada (1992, by P.Y. Wong and I.M. Brodo). The few lichens that we have not yet rediscovered since Macoun Club member Loney Dickson listed about 40 species in the 1972 issue of The Little Bear are shown in plain text, rather than boldface. We continue to use the names that were current when Lichens of North America was first published, but indicate taxonomic changes. What are the limitations of our evaluation? 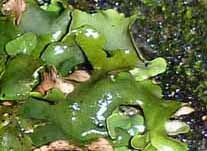 Most lichens are restricted in their habitat or substrate (the kind of thing they can grow on). In our Nature Study Area, we are fortunate in having a considerable variety of habitats to investigate, including minor amounts of both calcareous and silicious rock in a range of exposures; extensive deciduous and coniferous forests (up to 150 years old, but mostly younger); and trees and rocks in sunny fields, shaded forest, and soggy swamps. There are also microhabitats, and when we can, we examine trees from top to bottom. We also are lucky to have special habitats and substrates of very limited occurrence, without which certain species could not occur. These include the dry, weathered stumps of trees that were cut or died before the great fire of 1870 (good for old-growth indicators like Chaenotheca ferruginea and Micarea melaena); the bases of trees that are periodically flooded (essential for Leptogium rivulare); and partially uprooted White Cedar trees, which form the dark, humid caverns that are favoured by Chaneotheca furfuracea. The descriptions offered below are mainly what one might see without even a simple magnifying lens. 10X magnification usually shows the “dots” to be disks. Under 400X magnfication, thin slices of the disks reveal spores. Especially with crustose lichens, examination of the spores is often necessary as a first step in identifying the species. Leaf-like (foliose) and shrubby (fruticose) lichens can be identified by the detailed characteristics of their lobes and branches. Almost always, technical keys have to be used. Cobblestone Lichens (genus Acarospora) Acarospora canadensis A crustose lichen with many closely distributed, distinctively reddish-brown (almost purplish brown) disks with a grey rim. We found it on a slab of mudstone tossed out of woodchuck’s burrow many years ago, in a dense coniferous forest. It is infrequent in southern Ontario. John Macoun collected the world’s first specimen (the ‘type’ specimen) of this species at Hog’s Back Falls, in Ottawa, in 1897. A. fuscata An inconspicuous brownish lichen growing commonly on sandstone exposures and granite boulders in our Study Area; it is one of the most common lichens growing on rock in southern Ontario. 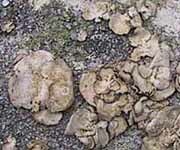 A. glaucocarpa Rather large (up to 3 mm wide), dusty pinkish brown disks with thick rims, on limestone. It is frequent in southern Ontario. We have found it on a limestone boulder in an old stone wall, and in the old railway cut along our northern boundary. Ribbon Lichens Allocetraria oakesiana A medium sized, yellowish green foliose lichen, with long, ribbon-like lobes that are roughened with soredia along the edges. It grows on wood and tree bark in shaded forests. We have found it only once, on an old, burned stump. It is common in southern Ontario. Button Lichens (genus Amandinea) Amandinea dakotensis (Formerly known as Rinodina dakotensis.) We have found it on a Butternut branch along an old stone wall, on the rough bark of a White Birch in mixed woods, and in the crown of an old Basswood in the forest. Infrequent in southern Ontario. A. punctata (Formerly known as Buellia punctata.) Visible as little more than a speckling of black dots, each the size of a period at the end of a sentence. We have found it on the loose bark of dead White Cedars around the ponds, and high up on the trunks of Terri Oda’s and Katherine Kitching’s study trees, both mature Basswoods that recently fell down. Considered infrequent in the Ottawa area, but very common across southern Ontario. Dot Lichens (genus Anisomeridium) Anisomeridium polypori The tiny black fruiting bodies of this pyreno-lichen (like a volcano) are closely scattered over the outside of tree bark, while the body of the lichen lives inside the outermost, dead layers. Scrape the bark with your fingernail and the lichen’s yellowish green algal partner is visible. We have found it once only, on the bark of a big, old Basswood in our Study-Tree woods. It is rarely seen in southern Ontario, or the Ottawa region. Comma Lichens Arthonia byssacea A good many comma lichens appear as clusters of almost flat, irregular blackish marks on tree bark, but this one produces instead fuzzy white bumps. We have found it once, on cedar bark in the big cedar swamp. It is rare in southern Ontario, and new to the Ottawa region. (Chrysothrix caesia) Another oddball in this genus, the Frosted Comma Lichen is very common and readily visible lichen, forming small, powdery, pale greenish splotches on tree bark, with faint bluish dots. It is abundant on the lower parts of small trees, and also occurs in the canopy of the forest, where the sunlight is strong. A. punctiformis A very rare and hard-to-see lichen — just a cluster of tiny, irregular black dots on tree bark. It hasn’t been seen in southern Ontario since John Macoun collected it a hundred years ago. We found it on the upper trunk of Katherine Kitching’s fallen Basswood (her favourite Study Tree). (No English name) Arthothelium ruanum Pale, circular patches on the smooth bark of young trees, much dotted with small, irregular black spotches. It has not been seen much in southern Ontario since John Macoun collected it more than 100 years ago. We have found it once, scattered up and down the lower trunk of a young Basswood tree. (No English name) Arthopyrenia sp. Minute black bumps on a pale grey stain on smooth bark. We found it alongside Arthothelium ruanum. If our specimen proves to be Arthopyrenia padi, it would be rare in southern Ontario. But our specimen differs in one technical detail (the pseudoparaphyses are slender, rather than thick). Dot Lichens (genus Arthrosporum) Arthrosporum populorum (Sometimes known as Bacidia populorum.) More black dots on bark. Recorded only a very few times in southern Ontario. Our specimen is a first record for both Ottawa and eastern Ontario. We found a little bit of it on the smooth bark of a young Basswood in the open. Sunken Disk Lichens Aspicilia verrucigera A thick, grey crust abundantly marked with black dots. It grows on granitic rocks and is frequent in the Ottawa area. Dot Lichens (genus Bacidia) Bacidia polychroa Dark reddish brown dots on bark. Bacidia spores are needle-like, divided into sections by cell walls. This one is 53 microns long. We have found B. polychroa on Black Ash and Basswood trees in wooded swamps. It is common in southern Ontario. B. rubella We have found this lichen only three times, twice in bark crevices on 130-year-old study trees (White Ash), and once on an even older Eastern White Cedar in the big cedar swamp. The granules that make up the body of the lichen — they are about one-tenth of a millimetre across — are green with algae, while the pinkish disks are the lichen’s fruiting bodies, which contain only fungal hyphae and spores. It is considered rare, and is something of an old-growth indicator species. B. schweinitzii Black disks about 1 mm across on a granular green crust, on tree bark in shady forests. It has been named the “Suprise Lichen”, because on the inside, the black disks are richly coloured reddish-brown and bluish-green. We have found a few hand-sized patches on White Cedar trees in the big cedar swamp. It is considered frequent in the Ottawa region. Brown Sunken Disk Lichens Bellemerea cinereorufescens See Lecanora sp. no. 2, sensu Brodo 1981. Dot Lichens (genus Biatora) Biatora vernalis There are several Dot Lichens, and this pale greenish one forms diseased-looking patches on moss over rock. The dots are the tiny pinkish fruiting bodies, which can be abundant. It is considered rare in southern Ontario. We have found it twice. Horsehair Lichens Bryoria furcellata Forms tangled clumps of coarse hair-like strands on tree branches. It is usually on conifers (and we have found it on Jack Pine branches), but our specimen was on a Pin Cherry sapling, near the pines. It is still common in southern Ontario, but less so than a century ago. Button Lichens (genus Buellia) Buellia dialyta Small, hemisherical black bumps on a bumpy gray thallus. We have found it only once so far, on a dead, weathered White Cedar. It is rare in the Ottawa region. Tiny black discs (0.25 mm across) with brown, two-celled spores only about half as long as in B. stillingiana, as drawn just below. We have found it with Calicium trabinellum on the weathered wood of a fallen Tamarack in the big cedar swamp. It is new to Ottawa, and rare in southern Ontario. B. stillingiana Large black discs (1 mm) on whitish patches on tree bark. It should be fairly common, but we have found it only three times so far. In cross section, the black colour is seen to be only a surface layer, with columns of dark spores inside. Under high magnification, these are brown and two-celled. Each is about twice the size of a human red blood cell (or about 16 x 7 microns). B. turgescens Black dots on a thin brownish lichen thallus on sandstone bedrock and on an igneous boulder. It is rare in southern Ontario, and we have found it only twice. Stubble Lichens (genus Calicium) Calicium parvum Stoutly stalked black fruiting bodies, each about 1 mm tall. Note the faint, whitish rim on the cup holding the spore mass. We have found it on a tottering old stump in the big cedar swamp. It is rare in southern Ontario, and new to the Ottawa region. Stout black stalks with a yellow dusting on the cup holding the black spore mass. 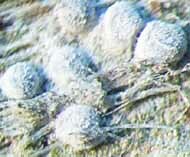 The two-celled spores are rough and deeply incised, about the size of two red blood cells stuck together. We have found it only once, in the big cedar swamp, on the hard, weathered wood of a fallen Tamarack that is suspended at about knee height. This lichen is rare across southern Ontario, but is considered frequent on the Quebec side of the Ottawa River. Firedot, or Jewel Lichens Caloplaca ahtii Tiny, slightly waxy-looking yellow dots on small dark gray patches on smooth Basswood and Balsam Poplar bark. C. arenaria Tiny dull orange dots on igneous rocks in old stone walls. It is frequent in the Ottawa area. C. borealis Re-examination of the specimens suggests they are actually C. ahtii. C. cerina Yellowish orange dots with grey margins, on gray patches of bark. Appears to be common on young poplars. Common also across southern Ontario. C. flavorubescens Rare in the Ottawa area, and across southern Ontario. We found it on smooth Basswood bark. Orange dots on a yellow thallus. C. flavovirescens A conspicuous yellow-and-orange lichen encrusting limestone rock. Common across southern Ontario. C. holocarpa Orange dots on the smooth bark of poplars. It is common in southern Ontario. C. sideritis Tiny golden brown dots with thick grey rims, on igneous rock. It is rare in southern Ontario; we have found it twice. C. ulmorum Infrequent in the Ottawa area; we found it on a Butternut branch. Yellow dots with whitish margins. Candleflame Lichens Candelaria concolor A very common and readily visible yellowish-green foliose lichen — with very minute features. We usually find it on the bark of any tree examined, whether in the forest or in the open, and occasionally on rock, as shown here, much enlarged. Goldspeck Lichens Candelariella aurella Yellow dots on limestone. Common in southern Ontario. C. efflorescens Yellow, granular patches on tree bark. Infrequent in the Ottawa area. 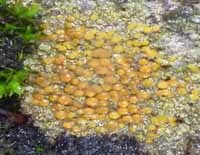 C. vitellina Bright yellow dots speckled over sandstone or granite, together with tiny, smooth yellow patches of lichen. (The dark areas here are just intense shadow.) Sometimes we have found it on tree bark, too (including poplar and Basswood tops). Very common in southern Ontario. Stubble Lichens (genus Chaenotheca) Chaenotheca brunneola Tall black stalks (all of 2 mm!) with brown tips, without the white dusting that characterizes Ch. trichialis. The rest of the lichen, the part with the algae, grows inside the bare wood. We have found it once, on the softly rotted wood at the base of a dead Tamarack, deep in the big cedar swamp. It is rare in both the Ottawa area and southern Ontario. Ch. chrysocephala Clusters of intensely yellow or greenish yellow bumps, with black-stalked fruiting bodies that are also yellow at the top. Our specimen, shown at right, came from the bare, dry wood of a dead Tamarack in the big cedar swamp. It is new to southern Ontario. Ch. ferruginea Patches of tiny, stoutly stalked fruiting bodies on a pale greenish thallus that has orangish spots; we find it growing on the much weathered wood of pine stubs and stumps that died in the fire of 1870. Rare in the Ottawa area; infrequent in southern Ontario. Ch. 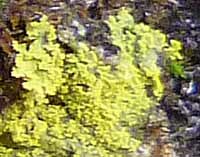 furfuracea Bright yellowish-green, powdery lichen with fruiting bodies on long, thin, yellowish green stalks. We frequently find it on rootlets in the dark, dank cavities under wind-heaved White Cedars in our cedar swamps, but otherwise it does not seem to have been collected in southern Ontario since 1960. Ch. gracilenta Formerly known as Cybebe gracilenta. 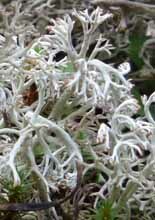 Delicate, wavy black stalks with small, buff-coloured spores masses at the tip. The body of the lichen, which is where the algae are found, is a powdery greenish mass (faded to pale brown here). We have found it only once, in a gap in the thick bark right at the base of a very old Eastern White Cedar. It is new to both Ottawa and southern Ontario. “Ch. gracillema” Tiny black stalks with a cup that holds the spore mass. We have found it only on the dry, weathered wood of two dead Tamarack trees a metre apart, in the big cedar swamp. We thought it was Chaenotheca gracillema because of the brown dusting of the cup that holds the spores, but on further examination, it doesn’t completly match the description of that species (or any other that has yet come to our attention). Ch. laevigata A long-stalked (2 mm) stubble lichen that appears yellow-tipped, growing out of a lumpy grey-green thallus. We found it on the centimetre-thick bark of an old-growth Eastern White Cedar, down in the big cedar swamp. It has been reported only once before in southern Ontario, and is new to the Ottawa region. Ch. stemonea A powdery greenish lichen with slenderly stalked fruiting bodies. The cup that holds the spore mass is light brownish white. Our specimen comes from the bark of an old cedar tree that is just barely alive, down in the big cedar swamp. It has been found on the Quebec side the Ottawa River, but is new to southern Ontario. Ch. trichialis A black stubble lichen with a reddish brown spore mass, and a whitish coating near the end of the stalk, both features being just visible on the lone apothecium towering a millimetre over several of Chaenothecopsis savonica, below. We found it on the softly rotted wood of a tottering old tree. It is rare in southern Ontario, and new to the Ottawa region. Stubble “lichens” (genus Chaenothecopsis) Chaenothecopsis debilis A fuzz of very short (0.5 mm) stalked apothecia on old wood or sometime bark. We found ours on rotted wood in a sunken wound on a small Black Ash tree in our southern cedar swamp. It is one of the two most commonly enountered Chaenothecopsis species in northeastern North America, but has rarely been collected in southern Ontario. Ch. 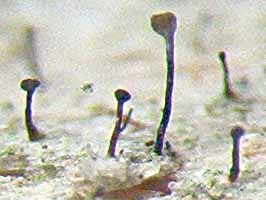 pusiola Tiny black stalks with pale, two-celled spores. We found it on a dead Tamarack. It is new to Ottawa and southern Ontario. Tiny, delicate stalks with black, rounded heads, that live parasitically, rather than being lichenized. They are shorter than the solitary stalk of Chaneotheca trichialis growing amoung them. Some members of the genus Chaenothecopsis often look like the much more common Mycocalicium subtile, but its spores are larger and darker brown, with almost pointed ends.We find this species in the big cedar swamp, on the bark or bare wood of very old cedar trees, and on deeply rotted tree stumps. It has been reported only once before in southern Ontario. Reindeer Lichens Cladina mitis Common in southern Ontario, forming yellowish green mats of highly branched stems on exposed ground. The genus Cladina has been brought back into Cladonia. C. rangiferina True reindeer lichen, which forms silvery or bluish-grey mats over rock and thin soil. We frequently find it in exposed places in our Study Area. 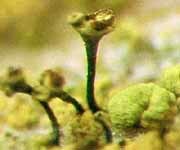 C. stellaris Forms compact, smoothly rounded mounds of yellowish green lichen so intricately branched that there doesn’t seem to be a main stem. We find it on open ground among other reindeer lichens. 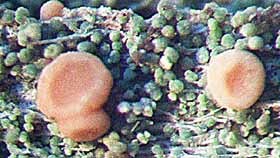 Members of the genus Cladonia are among the most commonly seen greenish lichens encrusting and growing over rotted and weathering wood, thin soil, and rock. 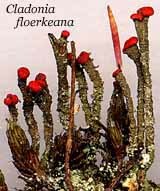 In some (notably C. cristatella, British Soldiers), the stalks are tipped with bright red fruiting bodies. In the last year, we have only just started to look for the Cladonias reported in 1972 by Macoun member Loney Dickson. We comment here only where we have made our own observations. Cladonia chlorophaea and C. pyxidata are very common pyxie-cup lichens; C. phyllophora is a little less so. C. floerkeana(Gritty British Soldiers) is a more southerly species that is new to southern Ontario, but is being ground out of existence by the trampling of hikers. C. cristatella (British Soldiers) and C. macilenta (Lipstick Powderhorn), which also have red apothecia at the top of slender stalks, is a much more common lichen. 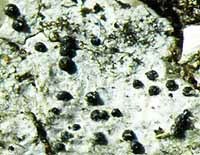 C. subfurvum Small, infertile patches of jelly lichen occur frequently on limestone boulders in our Study Area. It is frequent in the Ottawa region. Old-wood Lichens Cresponia sp. Formerly Lecanactis. Small, flat, blackish discs with a greenish cast. We have found it several times in the cedar swamps, once on the the damaged bark of a White Cedar where a wire fence was nailed to it at least 50 years ago, and twice on the dry wood of old wounds on Tamaracks. It is considered an old-growth indicator species, and is rare in southern Ontario. This is one of the few species of Cyphelium that is conspicuous and bright greenish yellow, with a scattering of black dots. We have found it several times on isolated conifer stumps around the ponds. 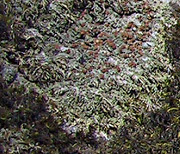 Tan coloured, leathery lichens when dry (like D. miniatum, immediately below), but which turn bright green when wetted, as shown at right. It is common on rocky streambeds and lakeshores in the Ottawa area. We found a single large thallus (4 inches across) on a granite boulder in a vernal pond. Small, circular, leathery lichens on limestone. We have found it only once, on a boulder in a maple forest. It is infrequent in the Ottawa area. *Lichens of the Ottawa Region, first edition. In the second edition, it is given as Bellemerea sp. All photos donated or provided by members and leaders, past and present (almost all on these pages are of Study Area lichen specimens). Developed mainly between June 2002 and 2006 by Macoun Club leader Robert E. Lee. Additions and new photos occasionally, most recently on July 12, 2011. Coding revised in 2013 and 2016.